The Virginia Family Hotel is a 3-star resort close to the nearby village of Koskinou. It comprises of a collection of 10 small buildings, set in peaceful, countryside surroundings. 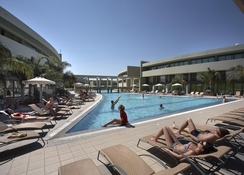 The Virginia Family Hotel has no less than five fantastic swimming pools, sports and entertainment facilities and is less than 250m from the sandy beach. The grounds are surrounded by trees, flowers, grass and there is a lake with a waterfall too, ideal for calming couples holidays. The nearby city of Rhodes Town houses many historical and medieval landmarks, beaches and museums including the Colossus of Rhodes, one of the Seven Wonders of the Ancient World, making it a fascinating place to visit. The Virginia Family Hotel is set in a quiet location, very close to a small village called Koskinou nestled in the peaceful countryside. With atmospheric Rhodes Town only 5km away, The Virginia Family Hotel is ideally located for those eager to visit the islands attractions, including brilliant nightlife and authentic restaurants and bars on offer. Guests can use the bus service to explore the surrounding area, which is 100m from the hotel, it’s available from early in the morning until late at night. The nearest airport is 20km away. The Virginia Family Hotel has a choice of either a Standard Room or Studio. The Standard Rooms have either a Sea, Garden or Pool view. They have a shower, telephone and satellite. The Studio Rooms have one bedroom, bath and a kitchen with necessary equipment. They have either a Garden or Sea view, and again have satellite TV and a telephone. Both room choices have either a balcony or terrace and individual air conditioning. The Virginia Family Hotel has an on-site buffet style restaurant serving a variety of local and international cuisines on offer. There is also a large lounge in the main reception room of the hotel which serves drinks during the evening, where you can sit and relax while looking at the panoramic views of the sea and hotel gardens. There are plenty of food and drink options in the surrounding resort too for those who wish to experience local culture. 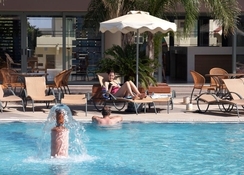 There are five swimming pools at the hotel, including a children’s pool which is located next to a children’s playground area. 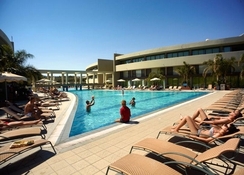 There is also a TV Lounge, table tennis, volleyball and bike rental facilities to enjoy in the resort. Outside of the hotel, visit the nearby beach and interesting Rhodes Town, sure to entertain visitors young and old. Children’s playground in the form of a boat with slides, swing etc. Cannot fault it's traditional style and food always something for everyone! Staff friendly and same year after year! Been 3 times now and would return again!